1. If Disney made an animated movie about you as Princess Ruth, which Disney hero would you choose as your Prince? Princess Sparkle (because I love all things glittery and shiny!) would choose Prince Charming, because he’s, well, charming, and she’d love to live in a castle. 2. In which genres and subgenres have you been published, and what does your narrow or sweeping focus say about you? I’ve published 4 Medievals (and a Medieval novella), but my next two will be humorous women’s fiction. The one after those should be a time travel to Elizabethan England with a paranormal hero. I hope writing in multiple genres and mixing genres says I’m creative with a lot of ideas and characters and that I love research. Definitely Denzel. He’s so talented and cool. I released two versions of my first book, one with an “open bedroom door” that has the hero on the cover and one with a “closed bedroom door” that has the heroine on the cover. I’d hoped to interest readers who like some heat and those who prefer sweet. Unfortunately, the heroine’s book didn’t do very well. I’d take FOLLOW YOUR HEART, my second book, because I love the characters and that the heroine is a stained-glass painter. And I’d take Margaret George’s THE AUTOBIOGRAPHY OF HENRY VIII because I couldn’t put it down and it’s very, very long. I received hundreds of rejections for more than 10 manuscripts and also at least a dozen revision letters from agents and editors before I self-published (meaning they were very interested in this or that project but wanted some changes before offering a contract). I learned that I wasn’t going to get the traditional publishing call I’d wanted, so I self-published. None of the above. I’m also an actor, so if I’m going to spend time online in addition to following or contributing to my feeds, I’ll watch a web series or film someone I know is in or from someone I hope to work with. Annora of Amberley from my fourth book, MY ONCE & FUTURE LOVE. I appreciate her willingness to take risks, her determination and ability to remain mostly positive in the face of adversity. Pantser! And I give workshops about it. I read books about plotting and took workshops, and though I tried and tried, couldn’t get words on the page until I went back to pantsing. I’m afraid of the dentist’s drill (my mom says it’s because when I was four, a dentist drilled with no Novocain). I force myself to go for a cleaning every time they send the reminder postcard because I’m more afraid of what might happen if I don’t. For AT HIS COMMAND, I visited Castle Rising in England and made it the heroine’s home. And I took the picture of it that’s on the cover. Does everyone have a strange snack/combo except me? I love peanut butter and chocolate ice cream in general, and in particular Target’s Market Pantry version. I wish it came in a single-serve size because it’s so tempting…. Set weekly word goals and keep writing new pages. Sir Nicholas Grey’s scout leaned forward in his saddle, holding up two fingers to let the others know two horses approached. Nicholas heard only the slight jangling of harnesses blended with wind rattling through the trees, but relied on his scout’s uncanny ability to hear what no one else could. He and his eight men sat alert, deep enough in the forest to avoid being seen while maintaining a clear view of the road through leafless branches. Nine armed men could frighten travelers. ‘Twas best to let them pass. Each man watched, each horse sinking deeper into chilling mire as a mud-covered, black palfrey plodded over the rise in the road, its long mane whipping in the frigid winds. “No rider,” Martin, the scout, murmured. “Look again,” Nicholas replied. At first he too had thought the horse was riderless. Now he could see a woman collapsed on the animal’s back. Her dark hair draped down its flank, mingling with the horse’s mane. The palfrey placed each step as if trying not to jostle its burden. Another horse, this one a brown rouncey ridden by a thin, balding man, galloped after the palfrey. A look of triumph brightened the man’s face as he spotted the horse ahead of him. He bent forward, extending his hand. Fingers like talons grasped the woman’s tangled hair. Amice Winfield jerked awake. Agony forced her head back, allowing her to see the man who gripped her hair as though he’d perish if he let go. She screamed. Arrows of fear pierced her as she clawed at his fingers. Her horse bolted, leaving her dangling from Harry’s hand by a small clump of hair. The long strands held for a few seconds, then tore from her head. Pain seared her scalp. She dropped into a puddle. Stunned by her fall and her stinging head, Amice could only stare at her tormentor while freezing water soaked her clothes. How she hated him. How she regretted her desperate flight from home. But what other choice did she have? Harry gaped at the dark tresses hanging from his hand. He threw them to the ground as she struggled to rise. Panic gripped her as his hostile glare changed to a slow, confident smile. “There’s nowhere to run. I’ll catch you if it’s the last thing I do,” he vowed. He leapt off his horse. Amice tugged her sodden skirts, trying to haul them out of the puddle. Where was her mount? Too far away to reach without being caught, weighted down as she was. Sprays of water flew as she heaved her skirts over her arm. Heart racing, she ran for the trees. A branch snagged her. With a cry of frustration, she pulled the wet wool until it wrenched free. Ignoring twigs tearing at her skin and icy mud that sucked away one of her shoes, she forged ahead. She gasped for air as she plunged into a tiny clearing, then came to an abrupt halt at the sight of a group of mounted men. AT HIS COMMAND (Historical Romance Version), Wars of the Roses Brides Book 1, is available for purchase through Amazon. 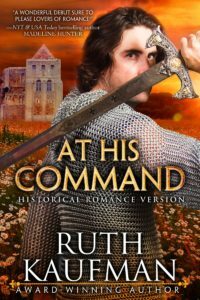 Ruth Kaufman is the Amazon bestselling author of the Wars of the Roses Brides trilogy (AT HIS COMMAND, FOLLOW YOUR HEART and THE BRIDE TOURNAMENT) and MY ONCE AND FUTURE LOVE. Accolades include 2016 Booksellers Best Award Best Historical and Best First Book winner and Romance Writers of America® Golden Heart® award winner. An actor, speaker and storyteller with an M.S. 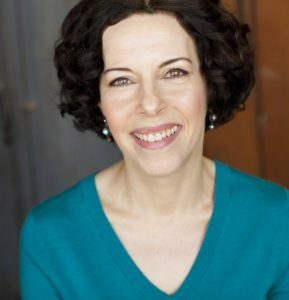 and J.D, Ruth has had roles in independent feature films, web series, pilots, national TV commercials and hundreds of voiceover projects. She enjoys living in Chicago and singing in a symphony chorus. Learn more at www.ruthkaufman.com, www.ruthtalks.com and her blog “Gainfully Unemployed” . Follow her through these social-media channels: Facebook, Twitter, Goodreads, her Amazon Author Page and Instagram @ruthjkchi. Always love seeing inside the mind of an author. 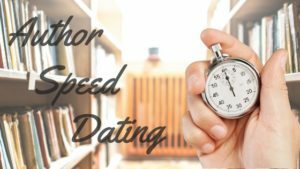 Thank you for these great Author Speed Dates.